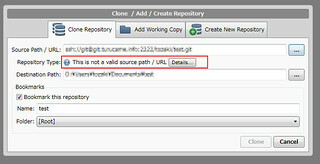 At first, clone repository on SSH. you will get a error message like below. 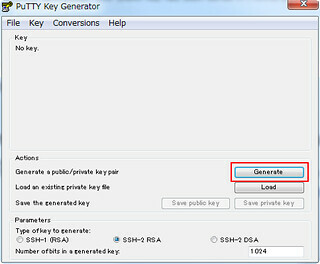 Select "Tools / Create or Import SSH key", then PuTTYgen dialog open. set parameters "SSH-2 RSA" and click "Generate". PuTTYgen start to Generate key. It tells"Please generate some randomness by moving the mouse over the blank area". The key generated. and enter "key passphrese" (it's used to login SSH gateway), and save private Key and copy public key and save it. Select "Tools/Launch SSH Agent(Pagaent)", then input dialog for passphrese opened, so enter passphrese and OK. If you use it to connect Git service, visit service setting page and register it. Clone repository on SSH and now get no errors.